I have a new breakfast cookie recipe for you today. These Muesli Breakfast Cookies are sure to please. They have no added sugar, and you only need 4 ingredients to make them. Perfect for kids. If you are on the lookout for more healthy breakfast recipes, you can try this and also this. 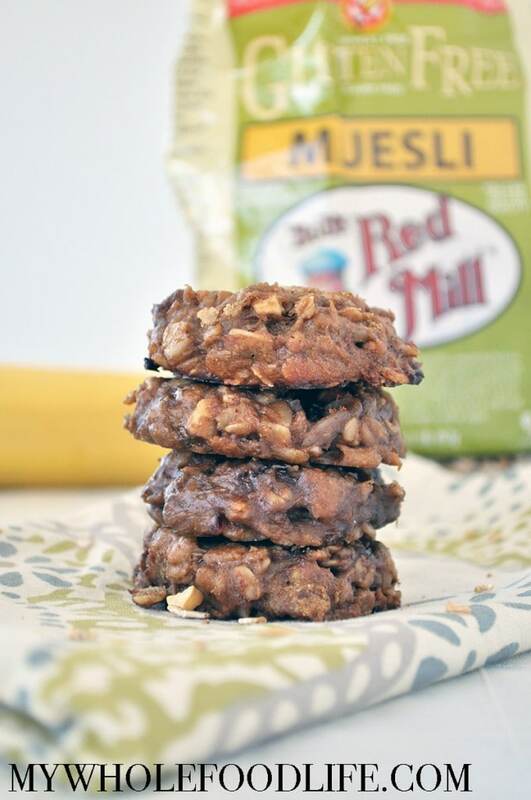 I used Bob’s Red Mill’s gluten free muesli for these healthy muesli breakfast cookies. It’s packed full of yummy ingredients like gluten free oats, coconut flakes, almonds, dried apples, pumpkin seeds and more. These are very hearty and filling, so they will hold you over until lunchtime. A healthy and easy breakfast cookie recipe! In a large bowl , mix the mashed banana and nut butter. Then add the cinnamon and muesli. Using a cookie scoop , drop cookies onto a lined baking sheet. The batter will be sticky. Use your palm to press each cookie down slightly. Let cook completely before removing from the baking sheet and storing in an airtight container. These should last at least 2 weeks in the fridge. They can also be frozen up to 6 months. Enjoy! Disclaimer: I was given a free bag of Bob’s Red Mill’s Gluten Free Muesli, but opinions are all my own. Thanks for supporting the brands I love! What Would be considered a serving for breakfast? They sound great! I am thinking that eating one may not keep me satisfied till lunch! I think 2 or 3 would make a serving. I added a bit of maple syrup (maybe an 1/8 cup) and it gave the cookies a bit of extra sweetness! Great recipe, thank you! You are so welcome! Glad you liked them. Can I sub gluten free oats for the muesli? I don't know what the difference between them is and I already have oats in my pantry. I wanted to let you know that GF oats worked great. I did add a couple dashes of maple syrup because my bananas weren't very ripe. They were quick to make and I love that they are portable since on especially crazy mornings my son winds up having his breakfast in the car on the way to school. Thanks for the recipe! These look soooooooo awesome! Like those sticky buns but in cookie form! I cant quite believe that theres no added sugar in them!